When Wisconsin fell to then-No. 4 Virginia by seven points in the Battle 4 Atlantis Title game this fall, it served as validation more than a crushing defeat. The No. 25 Badgers mustered up just 46 points, as the Cavaliers’ usual stout defense stymied the Wisconsin backcourt. Despite outscoring Virginia in the second half, Wisconsin was limited to just 18 percent 3-point shooting. Ethan Happ led the Badgers with 22 points, but with no one else in double figures, Wisconsin was simply outlasted by an elite opponent. 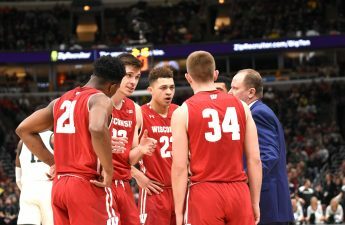 But after a 2017-18 season in which Wisconsin missed the NCAA Tournament for the first time in nearly two decades, the showing in Atlantis was promising. By competing toe-to-toe with a stacked Virginia team — last season’s No. 1 overall seed in the NCAA Tournament — and dominating other tough opponents early in the season, Head Coach Greg Gard’s bunch gave fans reassurance that this season would not be like the last — Wisconsin would find its way back to the big dance, where it has had a place for so many years. Ever since the Badgers rattled off an 11-2 start to the season, it’s been somewhat up-and-down. To put it plainly, Wisconsin has been severely inconsistent. While students were away for the winter recess, the Badgers went just 3-5, including home losses to Minnesota and Purdue and road losses to Western Kentucky and Maryland. Then came a brilliant stretch from Happ, who led Wisconsin to a Jan. 19 upset of then No. 2 Michigan at the Kohl Center, kicking off a six-game win streak that fittingly ended Feb. 6 in Ann Arbor. Over the regular season’s home stretch, Wisconsin’s inconsistencies were dramatically exposed. The team shot just 29 percent from deep over the season’s final month after shooting a remarkable 41 percent during the winning streak. Opponents exposed Happ’s brutal free-throw shooting struggles, while his teammates struggled to pick up his slack over a difficult stretch of Big Ten play. Wisconsin’s backcourt, which looked poised to properly and consistently supplement Happ’s offensive production at the beginning of the season, significantly lost its steam. Brad Davison and D’Mitrik Trice could not deliver on a nightly basis despite shouldering heavy responsibility, and Nate Reuvers has not looked the same after a promising January. 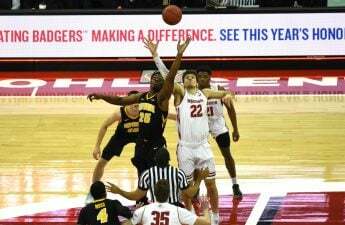 In their place, role players like Khalil Iverson and Brevin Pritzl have demonstrated leadership, carrying the team at times down the stretch. 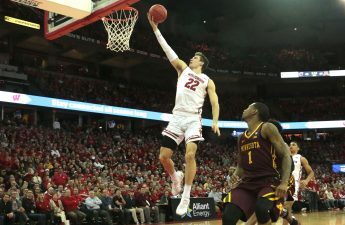 Iverson’s revival over the last few games of the season gave Wisconsin’s offense a newer, more explosive dimension that had yet to be unleashed. Pritzl’s premier outside shooting has opened up the floor for Happ and, in turn, given others open looks. 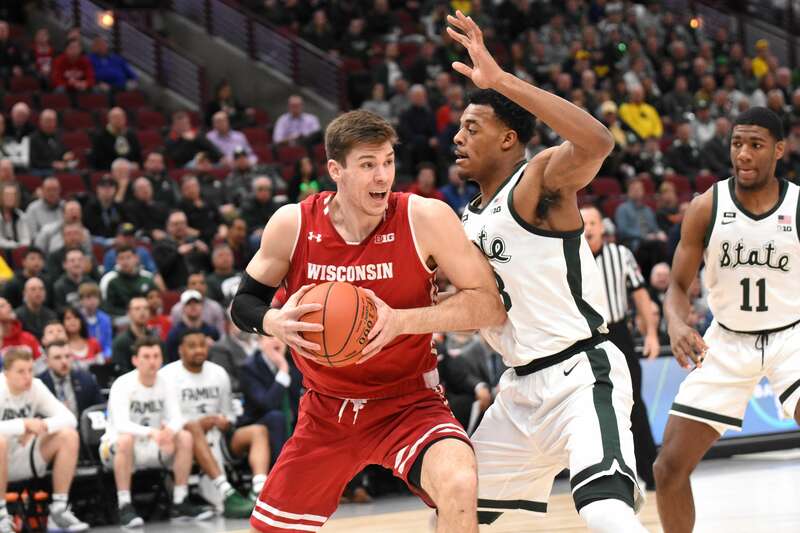 And Kobe King, whose role on the team has seemed murky at times, looked more confident in the Big Ten Tournament, particularly against Michigan State where he helped the Badgers force 15 turnovers. Wisconsin has dealt with the ups and downs of a season that many critics did not see coming with resilience. A 23-10 record, one of the nation’s top players and an emerging supporting cast give Wisconsin much to celebrate and look forward to entering the big dance. But even as the South Region’s No. 5 seed, the Badgers face a difficult path ahead. They will face No. 12 seed Oregon — the Pac-12 Tournament champions and winners of eight straight — in the First Round in San Jose, California Friday. A win there will secure a date with either No. 4 seed Kansas State, a team that heavily relies on its tough defense and experienced upperclassmen, much like Wisconsin, or No. 13 seed University of California-Irvine, who won 30 regular season games and relies on a slow tempo similar to Wisconsin’s. Yes, the south region is loaded with slowed-down offenses and stingy defenses. It’s fitting that its No. 1 seed is none other than Virginia, who Wisconsin would likely face in the Sweet 16 if they are still dancing. It’s unclear whether the Badgers’ supporting cast will show up, or whether Davison and Trice can shoot like they did to open the season. Perhaps more concerning is Happ. Will his free-throw shooting be an open wound that opponents will expose? Will teams expose a one-dimensional Badger offense that relies heavily on low-post scoring? We’ve shouldered these questions and concerns all season. It’s time for Gard, Happ & Co. to finally answer them and present themselves in their true form with their season on the line.